The New Maps are not just an Americana-laced pop/rock band from Austin, Texas, they are the creative outlet of business researcher Michael Hill, colleague of righteous Bizologist Laura Young. In addition to Hill on vocals, guitars and piano, The New Maps features Paul Grotevant on upright bass and vocals, and Jeff Olson on drumkit. The band, which formed in early 2011 and spent the last year playing shows around Austin, released its 11-song debut, These Parts, in January 2012. In addition to original songs by Hill and inspired performances by the band, These Parts features guest vocals from Hill's former Marmalade/Mudville Nine bandmate Kim Vance Baker and a re-imagined version of Bruce Springsteen's epic "Badlands." The album can be purchased digitally via iTunes or Amazon. 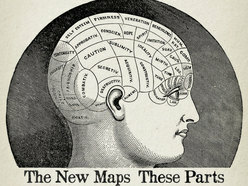 The history of The New Maps traces back to the mid-90s Denton, Texas scene, where Hill cut his teeth writing songs and serving as bandleader for acts like Marmalade, Mudville Nine and 12lb.Test, while also playing lead guitar and singing harmonies for Slobberbone and former Fever In The Funkhouse leader Nick Brisco's solo project, the Nick Brisco Band. Meanwhile, native Austinite Grotevant was in San Francisco playing bass with the likes of Matt Bauer and alt-country orchestra Angel's Camp, and another native Austinite, Olson, was finishing up grade school. Fast-forward to 2010 and Hill, back in Texas after a 6-year-stint in the Pacific Northwest, was performing with with fellow First Grade parent Grotevant, a founding member of The 145s, at Austin coffee shops. In early 2011 the duo invited Olson, sometime member of Balmorhea, to play a show with them at legendary Austin live music haunt The Hole In The Wall and The New Maps were born. Shortly thereafter, the trio took to recording and, a little less then a year later, These Parts was released. For more information, please visit the band online at www.thenewmaps.com.